1. Verify the customer concern by operating the engine to duplicate the condition. 2. Visually inspect for obvious signs of mechanical damage. Refer to the following chart. 3. If the inspection reveals obvious concerns that can be readily identified, repair as necessary. 4. If the concerns remain after the inspection, determine the symptoms. GO to Symptom Chart . Refer to the appropriate section in Group 303 for the procedure. INSTALL a new head gasket. Malfunctioning or damaged ignition system. Malfunctioning or damaged fuel system. Damaged valve tappet or lash adjuster. Damaged valve tappet guide or lash adjuster. REPAIR or INSTALL a new valve or valve seat. Malfunctioning or damaged air intake system. Damaged valve tappet guide or valve tappet. Weak or broken valve spring. INSTALL a new valve tappet or lash adjuster. INSTALL a new valve tappet guide or valve tappet. REPAIR or INSTALL a new valve. INSTALL a new valve spring. Worn valve stem or valve guide. INSTALL a new valve stem seal. INSTALL a new valve and valve guide. REPAIR or INSTALL new piston rings. Malfunctioning or damaged cooling system. Damaged timing chain tensioner (6L266). Seized or heat damaged crankshaft main bearing. Excessive connecting rod bearing clearance. Heat damaged connecting rod bearing (6211). Damaged connecting rod bushing (6207). Worn piston (6108) or piston pin (6135). Malfunctioning valve tappet (6500) or lash adjuster. Excessive valve tappet or lash adjuster clearance. Refer to the appropriate section in Group 414 for the procedure. ADJUST or INSTALL a new timing chain/belt. ADJUST clearance or INSTALL a new crankshaft main bearing (6333). INSTALL a new crankshaft main bearing. INSTALL a new thrust bearing or crankshaft (6303). INSTALL a new connecting rod bearing or connecting rod (6200). INSTALL a new connecting rod bearing. INSTALL a new connecting rod bushing. REPAIR or INSTALL a new cylinder block (6010). INSTALL a new piston or piston pin. INSTALL a new connecting rod. ADJUST clearance or INSTALL a new valve tappet guide or valve tappet. ADJUST clearance or INSTALL a new valve guide (6510) or valve. Damaged or plugged exhaust system. Malfunctioning valve tappet or lash adjuster. Compression leakage at valve seat. Damaged, worn or sticking piston ring (s). Refer to the appropriate section in Group 307 for the procedure. REPAIR or INSTALL a new valve, valve seat or cylinder head (6049). INSTALL a new cylinder head. REPAIR or INSTALL a new piston ring(s). INSTALL a new piston and piston pin. NOTE: When diagnosing engine oil leaks, the source and location of the leak must be positively identified prior to repair. Prior to carrying out this procedure, clean all sealing surface areas with a suitable solvent to remove all traces of oil. Use the UV Leak Detector Kit to carry out the following procedure for oil leak diagnosis. 1. Add gasoline engine oil dye. Use a minimum 14.8 ml (0.5 ounce) to a maximum 29.6 ml (1 ounce) of fluorescent additive to all engines. If the oil is not premixed, fluorescent additive must first be added to crankcase. 2. Run the engine for 15 minutes. Stop the engine and inspect all seal and gasket areas for leaks using the UV Leak Detector Kit. A clear bright yellow or orange area will identify the leak. For extremely small leaks, several hours may be required for the leak to appear. 1. Make sure the oil in the crankcase is of the correct viscosity and at the correct level and that the battery (10655) is correctly charged. Operate the vehicle until the engine is at normal operating temperature. Turn the ignition switch to the OFF position, then remove all the spark plugs (12405). 2. Set the throttle plates in the wide-open position. 3. Install a compression gauge such as the Compression Tester in the No. 1 cylinder. 4. Install an auxiliary starter switch in the starting circuit. With the ignition switch in the OFF position, and using the auxiliary starter switch, crank the engine a minimum of five compression strokes and record the highest reading. Note the approximate number of compression strokes required to obtain the highest reading. 5. Repeat the test on each cylinder, cranking the engine approximately the same number of compression strokes. The indicated compression pressures are considered within specification if the lowest reading cylinder is at least 75 percent of the highest reading. Refer to the Compression Pressure Limit Chart. If one or more cylinders reads low, squirt approximately one tablespoon of engine oil on top of the pistons in the low-reading cylinders. Repeat the compression pressure check on these cylinders. 1. If compression improves considerably, piston rings are faulty. 2. If compression does not improve, valves are sticking or seating incorrectly. 3. If two adjacent cylinders indicate low compression pressures and squirting oil on each piston does not increase compression, the head gasket may be leaking between cylinders. Engine oil or coolant in cylinders could result from this condition. Use the Compression Pressure Limit Chart when checking cylinder compression so that the lowest reading is within 75 percent of the highest reading. When a cylinder produces a low reading, use of the Engine Cylinder Leak Detection/Air Pressurization Kit will be helpful in pinpointing the exact cause. The leakage detector is inserted in the spark plug hole, the piston is brought up to dead center on the compression stroke, and compressed air is admitted. Once the combustion chamber is pressurized, a special gauge included in the kit will read the percentage of leakage. Leakage exceeding 20 percent is excessive. While the air pressure is retained in the cylinder, listen for the hiss of escaping air. A leak at the intake valve (6507) will be heard in the throttle body (9E926). A leak at the exhaust valve (6505) can be heard at the tail pipe. Leakage past the piston rings will be audible at the positive crankcase ventilation (PCV) connection. If air is passing through a blown head gasket to an adjacent cylinder, the noise will be evident at the spark plug hole of the cylinder into which the air is leaking. Cracks in the cylinder block or gasket leakage into the cooling system may be detected by a stream of bubbles in the radiator (8005). The following diagnostic procedure is used to determine the source of excessive internal oil consumption. 1. NOTE: Oil use is normally greater during the first 16,100 km (10,000 miles) of service. As mileage increases, oil use generally decreases. Vehicles in normal service should get at least 1,450 km per liter (900 miles per quart) after 16,000 km (10,000 miles) of service. High speed driving, towing, high ambient temperature and other factors may result in greater oil use. Define excessive oil consumption, such as the number of miles driven per liter (quart) of oil used. Also determine customer's driving habits, such as sustained high speed operation, towing, extended idle and other considerations. 2. Verify that the engine has no external oil leak as described under Engine Oil Leaks in the Diagnosis and Testing portion of this section. 3. Verify that the engine has the correct oil level dipstick (6750). 4. Verify that the engine is not being run in an overfilled condition. Check the oil level at least five minutes after a hot shutdown with the vehicle parked on a level surface. In no case should the level be above MAX or the letter F in FULL. If significantly overfilled, carry out Steps 6a through 6d. 5. Verify the spark plugs are not oil saturated. If the spark plugs are oil saturated and compression is good it can be assumed the valve seals or valve guides are at fault. a. Drain the engine oil, remove the oil bypass filter (6714) and refill with one liter (quart) less than the recommended amount. b. Run the engine for three minutes (10 minutes if cold), and allow the oil to drain back for at least five minutes with the vehicle on a level surface. c. Remove oil level dipstick and wipe clean. (Do not wipe with anything contaminated with silicone compounds.) Reinstall the oil level dipstick, being sure to seat it firmly in the oil level indicator tube (6754). Remove the oil level dipstick and draw a mark on the back (unmarked) surface at the indicated oil level. This level should be about the same as the MIN or ADD mark on the face of the oil level dipstick. d. Add one liter (quart) of oil. Restart the engine and allow to idle for at least two minutes. Shut off the engine and allow the oil to drain back for at least five minutes. Mark the oil level dipstick, using the procedure above. e. Record the vehicle mileage. Check the oil level regularly at intervals of 160 to 240 km (100-150 miles). Return to the service point when the oil level drops below the lower (MIN or ADD) mark on the oil level dipstick. Add only full liters (quarts) of the same oil in an emergency. Note the mileage at which the oil is added. g. Check the oil level under the same conditions and at the same location as in Steps 6c and 6d. Measure the distance from the oil level to the UPPER mark on the oil level dipstick and record. Measure the distance between the two scribe marks and record. Divide the first measurement by the second. Divide the distance driven during the oil test by the result. This quantity is the approximate oil consumption rate in kilometers per liter or in miles per quart. h. If the oil consumption rate is unacceptable, go to Step 7. 7. Check the positive crankcase ventilation (PCV) system. Make sure the system is not plugged. 8. Check for plugged oil drain-back holes in the cylinder heads and cylinder block. 9. If the condition still exists after performing the above steps, go to Step 10. 10. Perform a cylinder compression test or perform a cylinder leak detection test with Engine Cylinder Leak Detection/Air Pressurization Kit. This can help determine the source of oil consumption such as valves, piston rings or other areas. 11. NOTE: After determining if new parts should be installed, make sure correct parts are used. Check valve guides for excessive guide clearance. Install new all valve stem seals (6571) after verifying valve guide clearance. a. Remove the engine from the vehicle and place it on an engine work stand. Remove the intake manifolds (9424), cylinder heads, oil pan (6675) and oil pump (6600). b. Check piston ring clearance, ring gap and ring orientation. Repair as necessary. c. Check for excessive bearing clearance. Repair as necessary. 13. Repeat the oil consumption test (Step 6) to confirm the oil consumption concern has been resolved. Bring the engine to normal operating temperature. Connect the Vacuum/Pressure Tester to the intake manifold. Run the engine at the specified idle speed. The vacuum gauge should read between 51-74 kPa (15-22 in-Hg) depending upon the engine condition and the altitude at which the test is performed. 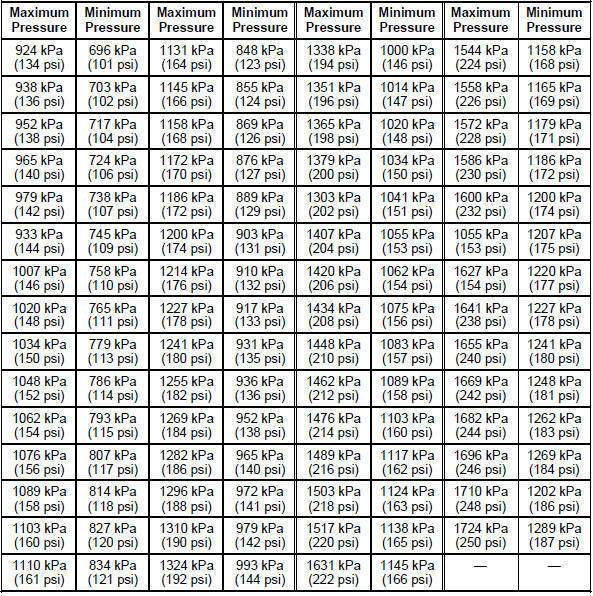 Subtract 4.0193 kPa (1 in-Hg) from the specified reading for every 304.8 m (1,000 feet) of elevation above sea level. The reading should be steady. If necessary, adjust the gauge damper control (where used) if the needle is fluttering rapidly. Adjust the damper until the needle moves easily without excessive flutter. A careful study of the vacuum gauge reading while the engine is idling will help pinpoint trouble areas. Always conduct other appropriate tests before arriving at a final diagnostic decision. Vacuum gauge readings, although helpful, must be interpreted carefully. Most vacuum gauges have a normal band indicated on the gauge face. The following are potential gauge readings. Some are normal; others should be investigated further. 1. NORMAL READING: Needle between 51-74 kPa (15-22 in-Hg) and holding steady. 2. NORMAL READING DURING RAPID ACCELERATION AND DECELERATION: When the engine is rapidly accelerated (dotted needle), the needle will drop to a low reading (not to zero). When the throttle is suddenly released, the needle will snap back up to a higher than normal figure. 3. NORMAL FOR HIGH-LIFT CAMSHAFT WITH LARGE OVERLAP: The needle will register as low as 51 kPa (15 in-Hg) but will be relatively steady. Some oscillation is normal. 4. WORN RINGS OR DILUTED OIL: When the engine is accelerated (dotted needle), the needle drops to 0 kPa (0 in-Hg). Upon deceleration, the needle runs slightly above 74 kPa (22 in-Hg). 5. STICKING VALVES: When the needle (dotted) remains steady at a normal vacuum but occasionally flicks (sharp, fast movement) down and back about 13 kPa (4 in-Hg), one or more valves may be sticking. 6. BURNED OR WARPED VALVES: A regular, evenly-spaced, downscale flicking of the needle indicates one or more burned or warped valves. Insufficient hydraulic lash adjuster or hydraulic lash adjuster (HLA) clearance will also cause this reaction. 7. POOR VALVE SEATING: A small but regular downscale flicking can mean one or more valves are not seating. 8. WORN VALVE GUIDES: When the needle oscillates over about a 13 kPa (4 in-Hg) range at idle speed, the valve guides could be worn. As engine speed increases, the needle will become steady if guides are responsible. 9. WEAK VALVE SPRINGS: When the needle oscillation becomes more violent as engine rpm is increased, weak valve springs are indicated. The reading at idle could be relatively steady. 10. LATE VALVE TIMING: A steady but low reading could be caused by late valve timing. 11. IGNITION TIMING RETARDING: Retarded ignition timing will produce a steady but somewhat low reading. 12. INSUFFICIENT SPARK PLUG GAP: When spark plugs are gapped too close, a regular, small pulsation of the needle can occur. 13. INTAKE LEAK: A low, steady reading can be caused by an intake manifold or throttle body gasket leak. 14. BLOWN HEAD GASKET: A regular drop of fair magnitude can be caused by a blown head gasket or warped cylinder head-to-cylinder block surface. 15. RESTRICTED EXHAUST SYSTEM: When the engine is first started and is idled, the reading may be normal, but as the engine rpm is increased, the back pressure caused by a clogged muffler (5230), kinked tail pipe or other concerns will cause the needle to slowly drop to 0 kPa (0 in-Hg). The needle then may slowly rise. Excessive exhaust clogging will cause the needle to drop to a low point even if the engine is only idling. 16. When vacuum leaks are indicated, search out and correct the cause. Excess air leaking into the system will upset the fuel mixture and cause concerns such as rough idle, missing on acceleration or burned valves. If the leak exists in an accessory unit such as the power brake booster (2005), the unit will not function correctly. Always fix vacuum leaks. When the pistons move downward, a thin film of oil is left on the cylinder walls. As the vehicle is operated, some oil is also drawn into the combustion chambers past the intake and exhaust valve stem seals and burned. Operation under varying conditions can frequently be misleading. A vehicle that has been run for several thousand miles on short trips or in below-freezing ambient temperatures may have consumed a "normal" amount of oil. However, when checking the engine oil level, it may measure up to the FULL or MAX on the oil level dipstick due to dilution (condensation and fuel) in the engine crankcase. The vehicle might then be driven at high speeds on the highway where the condensation and fuel boil off. The next time the engine oil is checked, it may appear that a liter (quart) of oil was used in about 160 km (100 miles). This perceived 160 km (100 miles) per liter (quart) oil consumption rate causes customer concern even though the actual overall oil consumption rate is about 2,400 km (1,500 miles) per liter (quart). Make sure the selected engine oil meets the current recommended API performance category with SAE viscosity grade as shown in the vehicle Owner's Guide. It is also important that the engine oil is changed at the intervals specified. Refer to the vehicle Owner's Guide. 1. Disconnect and remove the oil pressure sensor (9278) from the engine. 2. Connect the Oil Pressure Gauge to the oil pressure sender oil galley port. 3. Run the engine until normal operating temperature is reached. 4. Run the engine at the specified rpm and record the gauge reading. 5. The oil pressure should be within specifications; refer to the specification chart in the appropriate engine section. Check for damaged or severely worn parts and correct assembly. Make sure correct parts are used with the static engine analysis as follows. Check for loose mounting bolts, studs and nuts. Check for plugged oil feed in the rocker arms (6564) or cylinder head. Check for loose mounting bolts on camshaft carriers. Check for plugged oil feed in the camshaft roller followers, lash adjusters or cylinder heads. Check for broken or damaged parts. Check for bent push rods (6565) and restricted oil passage. Check for correct seating of the valve spring retainer key (6518) on the valve stem and in valve spring retainer (6514). Check for correct seating on the valve stem. Check for plugged oil drain back holes. Check for worn or damaged valve tips. Check for missing or damaged guide-mounted valve stem seal. Check collapsed valve tappet gap. Check installed valve spring height. Check for missing or worn valve spring seats. Check for plugged oil metering orifice in cylinder head oil reservoir (if equipped). Static checks (engine off) are to be made on the engine prior to the dynamic procedure. Check for missing or damaged valve stem seals or guide mounted valve stem seals. Check for a plugged oil metering orifice in the cylinder head oil reservoir (4.6L engine only). If insufficient oiling is suspected, check oil passages for blockage, then accelerate the engine to 1,200 rpm with the transmission in NEUTRAL and the engine at normal operating temperature. Oil should spurt from the rocker arm oil holes such that valve tips and camshaft roller followers are well oiled. With the valve covers (6582) off, some oil splash may overshoot camshaft roller followers. Check the lift of each camshaft lobe in consecutive order and make a note of the readings. 1. Remove the valve covers. 2. Remove the spark plugs. 3. Install the Dial Indicator Gauge with Holding Fixture so the rounded tip of indicator is on top of the camshaft lobe and on the same plane as the valve tappet. 4. Rotate the crankshaft using a breaker bar and socket attached to the crankshaft pulley retainer bolt. Rotate the crankshaft until the base circle of the camshaft lobe is reached. 5. Zero the dial indicator. Continue to rotate the crankshaft until the (1) high-lift point of the camshaft lobe is in the fully-raised position (highest indicator reading). 6. To check the accuracy of the original indicator reading, continue to rotate crankshaft until the (2) base circle is reached. The indicator reading should be zero. If zero reading is not obtained, repeat Steps 1 through 6. 7. NOTE: If the lift on any lobe is below specified service limits, install a new camshaft, and new camshaft roller followers. Remove the Dial Indicator Gauge with Holding Fixture. 8. Install the spark plugs. 9. Install the valve covers. Check the lift of each lobe in consecutive order and make a note of the readings. 2. Remove the rocker arm seat bolts, rocker arm seat (6A528) and rocker arms. 3. Make sure the valve tappet is seated against camshaft (6250). Install (1) Dial Indicator Gauge with Holding Fixture so the ball socket adapter of the indicator is on top of the valve tappet or (2) Dial Indicator Gauge Adapter is on top of push rod and in same plane as valve tappet push rod movement. 4. Remove the spark plugs. 5. Connect an auxiliary starter switch in the starting circuit. Crank the engine with ignition switch in OFF position. Bump crankshaft over until valve tappet is on base circle of camshaft lobe. At this point, valve tappet will be in its lowest position. If checking during engine assembly, turn crankshaft using a socket or ratchet. 6. Zero the dial indicator. Continue to rotate crankshaft slowly until valve tappet is in fully-raised position (highest indicator reading). 7. NOTE: If lift on any lobe is below specified service limits, install a new camshaft, and new valve tappets. Remove the Dial Indicator with Holding Fixture, Dial Indicator Gauge Adapter, and auxiliary starter switch. 8. Install rocker arm seats, rocker arms and rocker arm seat bolts. Excessive collapsed valve tappet gap can be caused by loose rocker arm seat bolts/nuts, incorrect initial adjustment or wear of valve tappet face, or worn roller valve tappets, push rod (6565), rocker arm (6564), rocker arm seat or valve tip. With valve tappet collapsed, check gap between the valve tip and the rocker arm to determine if any other valve train parts are damaged, worn or out of adjustment. An incorrectly functioning valve tappet can be sticking, caused by contaminants or varnish inside the tappet. The tappet can have a check valve that is not functioning correctly, which can be caused by an obstruction, such as dirt or chips that prevent the check valve from closing, or a broken check valve spring. A tappet with a leakdown time out of specification can cause tappet noise. If no other cause for noisy valve tappets can be found, the leakdown rate should be checked and new valve tappets installed if found to be out of specification. Assembled valve tappets can be tested with Hydraulic Tappet Leakdown Tester to check the leakdown rate. The leakdown rate specification is the time in seconds for the plunger to move a specified distance while under a 22.7 kg (50 lb) load. Air bubbles in the lubrication system will prevent the valve tappet from supporting the valve spring load. This can be caused by too high or too low an oil level in the oil pan or by air being drawn into the system through a hole, crack or leaking gasket on the oil pump screen cover and tube.